You are purchasing a 10 Volume 3% 500ml Hydrogen Peroxide bottle from Portuguese high quality medicinal brand, AGA. Apply with cotton wool or soft cloth as necessary. For mouthwash dilute with water. “Hydrogen peroxide is one of the few simple miracle substances still available to the public. Its safety and multiple uses ranks it right up there with Dimethyl sulfoxide (DMSO). If you've never used either of these compounds you are overlooking two of the most powerful healing tools ever discovered”. - Dr. David G. Williams. Altitude Sickness. Cerebral Vascular Disease. To many of us Hydrogen Peroxide is thought of as the chemical used to turn hair blonde. However it is available in a variety of different grades with varying properties utilized by commercial, industrial, medical, military, scientific and domestic uses. Food grade Hydrogen Peroxide is used in and around the home and body. It has a wide range of applications relating to many areas of daily life and health. 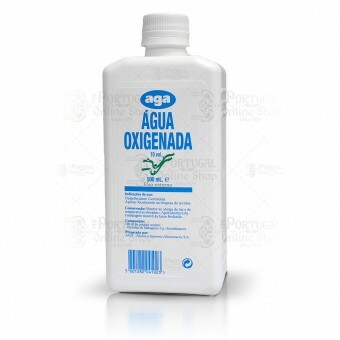 Hydrogen Peroxide or Hydrogen Dioxide as it is also known, is simply water with the addition of an extra oxygen atom. Its molecular formula is H2O2. It is a natural substance formed in the lower atmosphere when water vapour and ozone come together. It has many beneficial properties and is naturally found throughout nature and within all life forms. Fresh fruit and vegetables contain Hydrogen Peroxide both from rain water and formed by the process of photosynthesis. Our white blood cells produce Hydrogen Peroxide as part of our natural immune defence response and its production is essential for life. H2O2 easily breaks down into water (H2O) and an atom of free oxygen (O). It is this single oxygen atom that now gives the huge range of beneficial uses as an oxidizer. Within the body friendly bacteria flourish in oxygen rich environments whereas most strains of harmful bacteria (and cancer cells) are anaerobic (work without oxygen) and cannot survive in the presence of oxygen. Hence H2O2 is incredibly effective at treating infections topically. The number of ailments effectively treated by hydrogen peroxide is simply astounding. Over the past 25 years over 7,000 papers have been published in medical journals relating to the use and benefits of hydrogen peroxide. It does however cost relatively little and is of course non patentable. The pharmaceutical industry however would rather not promote H2O2 to us as the observed dangers and side effects are few in comparison to the huge spectrum of benefits when compared to pharmaceutical drugs which make huge profits.